Dagny married her husband, Boris, for money and now regrets it She has invited a gay couple, Roman and Mimi, around for drinks and tells them of a new love in her life. Though she is coy about saying what he does for a living, just saying that he is The Mechanic. So they think he works in a garage when in fact he is a male stripper and that is his stage name. Dagny complains about her husband and then goes indoors where her husband is. Whilst she is away Mimi and Roman end their own relationship. Dagny decapitates husband Boris. Then a real life genuine fairy turns up – re-unites Boris’ body with his head and runs off with him. Mimi tells Dagny he loves her. Roman is left alone in the garden when the Mechanic turns up. The Fairy Garden was published in Out Front: Contemporary Gay and Lesbian Plays, edited by Don Shewey (Grove Press, 1988). 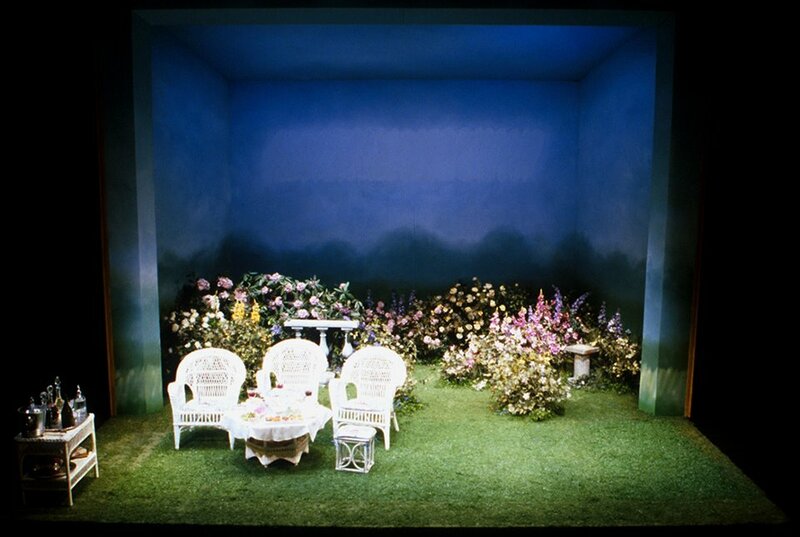 The set for the Second Stage production, designed by Andrew Jackness.